Can't help but to show off your eco-friendly "green" side? Hard Candy Cosmetics makes it easy to do! With a full line of cosmetic choices, specially designed to let you GO BOLD with their edgy and dramatic offerings. 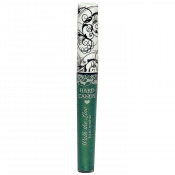 Show the world that you are a Green girl with Hard Candy Cosmetics! With vibrant, bold choices across the color spectrum, Hard Candy offers plenty of options to show off that you are eco-friendly! Available in both soft and stunning shades, my cosmetics tester loved this product. Unlike some other loose powder eye shadows, the Powder Keg container features a spill proof tube and sponge tipped wand to dip into the fine powder, ensuring the shadow gets on you and not all over your dressing table! The sponge dipping wand allows you to apply the pearlized powder lightly for a soft hint of color or layer it for a stunning look. Available in classic colors, like Licorice, Night Sky and Lace, Walk The Line can also satisfy your desire to add a drama with a subtle shine and daring color. My cosmetics expert reported that soft brush applicator was gentle to use, although she had to practice a few times to get just the right line, as she usually uses pencil liners. She loved that the Walk The Line product didn't smudge or smear at all; a huge improvement over her usual liner. Looking for WOW factor? 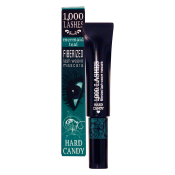 Hard Candy's fiber filled Lash Weave Mascara provides volume and separation, with Hard Candy colors to make them look twice! "Wow!" was the first comment from our resident tester who was impressed with the look she achieved from the Lash Weave formula and wide, thick applicator. Never have conducted animal testing and never will! bringing good drama to your makeup kit! Add Hard Candy to your color arsenal, order online from Walmart or pick up at your local Walmart store. Hard Candy Cosmetics is generously giving my readers a chance to show off their green and go BOLD! Five of my readers who enter this giveaway will win a 3 piece Hard Candy prize pack! The prize pack includes: 1000 Lashes Fiberized Lash Weave Mascara, Powder Keg Loose Eye Shadow and Walk the Line Liquid Eye Liner! This giveaway is open to residents of the US, ages 18+ and will end on Saturday, June 4, 2011 at midnight, EST. The winners will be randomly selected from all eligible entries and notified by email. The winners will have 48 hours to respond before I must move on to runner ups. Please leave your email address in your entry comments, in anti-spam format, if it is not available via your comment name, so I may contact you if you are one of the winners. 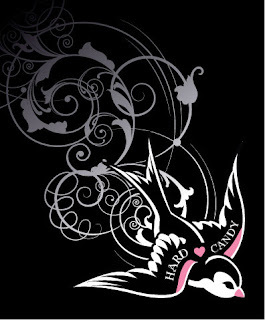 Please visit Hard Candy and then tell me in a comment something you learned about the company, something you love about their products or you favorite product in a comment here. Please also verify that you follow That's What She Said on Google Friend Connect. * Tweet about this contest using the tweet below. Leave a comment for each tweet. Max 3 per day for 1 entry each. "Showing my #green side! Entered to #win a @HeresHardCandy #cosmetics prize pack at That's What She Said @tsue1136 http://bit.ly/kVrazV "
* Enter any of my other active giveaways and take up to 5 entries for each additional giveaway you enter. Leave a comment for each entry, letting me know which giveaways you entered. * Share this giveaway in some other fashion: post on facebook, stumble it, digg it, blog it, add to a giveaway linky. Sharing must have direct link back here. Leave a comment with a link to your sharing. 2 entries per each sharing. Handy share button at bottom of post. On behalf of Hard Candy Cosmetics and That's What She Said, thank you to all entrants for following and participating! I was provided with a selection of Hard Candy Cosmetics to explore for the purposes of creating this review. Information and images taken from various Hard Candy websites. The opinions above are both honest and my own. Hard Candy Cosmetics is sponsoring the prize for this giveaway and is responsible for shipping. Visibly Wet - Glossy Lip Pencil looks like a fun product to keep handy in my purse. I LOVED the minis "Must-Have"! So cute and pratical! I had never seen or heard of the eye tattoos before but they look awesome! The Blush Crush would be nice to try. My favorite product is the So Baked Bronzer and I follow your blog publicly with google friend connect! I want the eye tattoos. I like the Glitteratzi Body Spray. My favorite product is the Lash Tinsel - Glitter Mascara. Their products are now available throughout Canada exclusively at Walmart. I am dying to try the Eye tattooes. I follow you on GFC, and my favorite product is the Glitteratzi - Eye Glitter Gel! I follow on GFR (kruney) and I wanna try the body powder! I love the Lip Tattoo - Lip Stain & Breath Freshening Gloss! I like the Show Girl All Over Body Glitter. I follow Hard Candy on twitter as ptowngirl. My favorite Hard Candy product is their baked meteor eyeshadow in space cadet. I visited Hard Candy's site and I like all the pink and purple nail polishes. I also like the Lip Tattoo - Lip Stain & Breath Freshening Gloss. Following @HeresHardCandy on Twitter @hle123. Following @tsue1136 on Twitter @hle123. I love love love the Outrageously Delicious - Flavored Body Powder--it rocks! I follow via GFC as strawberry, and I love Painted Lady - Manic shine in knockout. I Like Hard Candy on Facebook-Audrey F.
I like That's What She Said on FB-Audrey F.
I Follow Hard Candy on Twitter as tartstrawberry. I Follow That's What She Said on Twitter as tartstrawberry.